So many readers have written to ask what supplements I recommend to Protocol Participants (and where to find them), I’ve decided to add them here in one thread, along with occasional coupons and other useful links that are scattered in several of my posts. Echo Plus (2nd Gen) with Philips Hue Lightbulb. Normally $165 with the bulb, on sale for 5 days only – $110! Echo Plus has a built-in Zigbee hub to easily setup and control your compatible smart home devices, and improved sound for streaming music. If you are on SNAP or other government programs, after your free trial is over, you can sign up for Amazon Prime for only $5.99 a month! 16 or 32 GB of internal storage and a micro SD slot for up to 256 GB of expandable storage. All-new colours: Black, Marine Blue, Punch Red and Canary Yellow. Enjoy millions of movies, TV shows, songs, Kindle eBooks, apps and games – including Amazon Video, Netflix, Facebook, Spotify, TuneIn, Instagram and more. Enhance your entertainment experience with features you only get from Amazon – including ASAP, X-Ray, On Deck, Blue Shade and Fire for Kids Parental Controls. Amazon Channels is a TV streaming service that allows Prime members to add channel subscriptions for a low monthly subscription fee, available individually without the need for a bundle and without a contract. Amazon Prime members can now add channels like ITV Hub+, Discovery, Eurosport, Hayu, MUBI, BFI Player, MGM, Hopster, and Shudder across all devices with the Prime Video app, including connected TVs, streaming media players, mobile devices, Amazon Fire TV, Fire TV Stick, Fire tablets, and online at Amazon.co.uk/amazonvideo. Not all Participants take or need every supplement here, and individual lists (including the amounts and time of day to be taken) are based on the results of metabolic blood tests, but every item on this list has been extensively tested to make sure it’s actually useful. This is important because I’ve noticed a trend over the last few years of prospective Participants taking a wide range of useless ‘weight loss’ supplements (like Green Tea Extract) that promise to ‘burn fat’ without any scientific rationale at all. Which means they do nothing at all. Or they’re taking a less bio-available form than is optimal, or even taking the right supplement at the wrong time of day. Sometimes that matters. A lot. With the exception of NOW Foods Thyroid Energy, there are no recommended multivitamins. My research has shown that not only can’t you control the amounts of each particular vitamin or supplement in them, they often use the cheapest, least effective form. Magnesium Oxide instead of Magnesium Citrate, for example, or unbuffered Vitamin C (tough on the tummy), or Vitamin B12 as cheap Cyanocobalamin, instead of the superior, more bio-available Methylcobalamin. And they tend to have added sugars to mask the bitterness of many of the ingredients as well as the cheapest types of fillers. 1. Bring down blood pressure. 2. Bring down triglycerides and increase HDL. 7. Help with Vitamin. D absorption. 8. Raise Vitamin. D level. 9. Reduce high insulin levels. 10. Assist adipose fat burning. 11. Relieve Thyroid Hormone Resistance symptoms. If you have a proven supplement you’d like me to add to the list, please send the name, purpose and link in the comment section below and I will test, then post it. 1. Country Life Vitamin D 1000. Softgel, NOT from fish liver, which means you don’t have to worry about excess vitamin A. Take one four times a week in the evening in winter, fall and spring. Three times a week in summer. 2. Life Extension Magnesium Citrate 160 mg. One with a meal, and one every evening. If you are Hypothyroid and/or suffer from constipation, take an extra one in the morning as well. This mineral is crucial to human health and although we used to get sufficient amounts from food, world-wide depleted soil makes that impossible. 3. Solaray Calcium Citrate, 250 mg. One in the evening. This is the best bio-available form, and unlike calcium carbonate (though there is a bit in this), will not cause constipation. The label says 1000 mg per serving, but that’s for four caps and you only need one, so there are 480 servings per bottle. 4. MK-7, 100 mcg. This is a bio-available form of K2, which is crucial for Vitamin D and Calcium absorption. MK-7 directs calcium to your teeth and bones (where it belongs) and away from building up plaque in your arteries (where it most definitely does not belong). To learn more about why K2/MK-7 is so important to your heart health, read the definitive book on the subject: Vitamin K2 and the Calcium Paradox: How a Little-Known Vitamin Could Save Your Life. One with food and, for those who are insulin resistant or diabetics, one in the evening as well. This is the only K2 I’ve found in softgel form, which is the recommended by the author. Do not take Vitamin D or Calcium without taking K2! 5. Buffered C with Bioflavonoids, 500 mg. Best relief for constipation, for fighting off illnesses, and for general well-being and health. I take 1000 mg per day and (knock on wood) have not had so much as a sniffle for years. Take 1 capsule once per day with food for general health, or two capsules twice a day if hypothyroid and/or insulin resistant. For UK Readers: Ester-C with Bioflavonoids, 500 mg.
6. Best Naturals R-Lipoic Acid. Lipoic acid (LA) plays an important role in glucose metabolism and energy production. Because it is soluble in both water and fat, LA is known as the “universal antioxidant.” LA occurs in two forms, designated as “R” and “S.” Studies suggest that RLA, the natural form, is more biologically active than the S form. For those suffering from ‘brain fog’ in general, or from Hypothyroidism, the results of taking R-Lipoic Acid are remarkable. Within three weeks of my starting to take this, my ‘senior moments’ and words on the tip of my tongue were gone, and during the four years I’ve taken it, they’ve never returned. Take one every morning. 7. Acidophilus Pearls. Probiotics provide relief from constipation and lactose intolerance. Seriously, it works. One every morning. 8. Ubiquinol. If you are over thirty, or at any age have high blood pressure, heart disease or on any type of statin – and you take nothing else – take this. Ubiquinol is a stabilized form of co-enzyme Q10 (the cheap stuff you buy on the drugstore shelf, which is ubiquinONE, not ubiquinOL). Ubiquinol is a fat-soluble, vitamin-like compound found in every cell of the body, including the brain. We normally synthesize ubiquinol from ubiquinone (found in food), but begin to lose the ability to synthesize steadily after age thirty, so taking Co-Q10 is useless. And statins reduce ubiquinol in the body by 40% – which is why any ethical doctor tells patients to supplement with it when they hand over a statin prescription. Mitochondria in cells use ubiquinol to produce energy. Co-Q10 is found in highest concentration in cells of organs that require large amounts of energy, such as the heart, and it helps to keep arteries soft and supple. Although it takes a long time – about 6 to 8 weeks – to build up in the bloodstream, the blood-pressure lowering results after that can be dramatic. As if that wasn’t enough of a benefit, it’s also a powerful antioxidant. If you are under forty, have normal (less than 120/80) unmedicated blood pressure, no heart disease risk (like high triglycerides over 100), or are not on a statin, take 50 mg. in the morning. Otherwise, take 100 mg. in the morning. For UK Readers: Ubiquinol, 50 mg.
9. NOW Foods Thyroid Energy. Although I’d like to believe that my Protocol can help heal any metabolic problem by itself, severe thyroid hormone resistance sometimes needs extra support. Just as severe insulin resistance needs Metformin. This is one supplement that actually does this, and does it so well it actually raises low body temperatures within a few weeks. My research indicates that thyroid hormone resistance needs extra zinc, selenium and copper, and this supplement provides it all, along with B vitamins (including B-12 in its best bio-available form: Methylcobalamin) and iodine. More about which, below. Warning on Label: If you are taking any thyroid medications, MAO inhibitors, or any other type of anti-depressant medications, please consult your health care practitioner prior to use. Although the label recommends 2 capsules per day on an empty stomach, I find this so powerful and effective I take only one capsule four times a week with a meal, and take one 12.5 mg Iodoral the other three days. 10. Iodoral, 12.5 mg from Optimax. We are becoming an iodine-deficient nation in general, but those who eat a non-processed food diet have a likelihood of serious deficiency. Women and those with Hypothyroidism in particular have need of this essential element. Read more here. Warning: There is ongoing controversy about taking iodine supplementation if you have Hashimoto’s Disease, which can only be determined through blood tests. If you do have Hashi’s, consult with a medical practitioner before taking this. Take one daily with meal on a day when you do not take Thyroid Energy. For UK Readers: Iodoral, 12.5 mg.
Adipose fat is not just a benign lump of flesh. Cutting edge research has shown that it almost “has a mind of its own” and does not willingly or even always take orders from our brains. And what that mind likes to do most is send inflammation throughout the body (often indicated by elevated triglycerides), and especially to joints and arteries. When inflammation attacks joints, it inflicts two types of damage: pain, and destruction of joint cartilage in hips, knees and other places. When cartilage is gone and joints are “bone-on-bone” the pain becomes even more severe. Worse: inflammation is one of the leading causes of heart disease and increased risk for heart disease. It shortens our life-spans, too. There are three supplements that my research indicates (and for which I can personally vouch) have an astounding ability to reduce the pain of inflammation, though it takes several weeks for them to build up in the blood stream. And after trying it myself on two knees (one bone-on-bone already, and one almost there) for the last three weeks, I can recommend Hyaluronic Acid to mimic the lost cartilage and reduce pain even more. Joints depend on synovial fluid to lubricate joint tissue surfaces, reducing friction. The primary component of this synovial fluid is Hyaluronic Acid, which is the active substance in Synvisc – the injections for knee joints that can alleviate pain for three to six months. There are claims that it can, taken long-term, actually rebuild cartilage, and I agreed to ‘test’ that theory for my orthopedic surgeon by having new x-rays six months after starting it. We’ll compare earlier x-rays to see if those claims are true. However, I can now say that walking, even up or down stairs is no longer painful or a problem, and the knee that still showed a small amount of remaining cartilage on the last x-ray now feels perfectly normal. No more creaking or crackling noises when I bend it either. That is definitely progress! When pain hits, we want it to go away. Fast. Taking an Nsaid to relieve an acute problem like the occasional headache or sprained ankle is fine, but handling the chronic pain of the arthritis that inflammation can cause is tricky. Whether prescription (Celebrex, for instance) or over-the-counter medications (like Aleve or Tylenol), long-term use of these pain-killers are not without the danger of kidney and liver damage, and even elevated heart disease risk. Luckily, there are natural pain-relievers that don’t cause these problems, even long-term, don’t have toxic side effects, and are as good as Nsaids at lowering inflammation. Double-blind studies have shown them, in fact, to be better. 11. Boswellia Extract, 307 mcg. I’ve found these to be even more effective than Now Foods double-strength boswellia, and though I now take it twice a day (one in the morning and one before bed) for my knees, I took it four times a day (every six hours) before my recent hip surgery and required no standard pain-killers at all. Give it a few weeks to work. 12. 5-Loxin Boswellia Serrata Extract, 150 mg. For serious chronic pain, this is an extract of the most active ingredient in boswellia: AKBA. “5-Loxin is the only boswellia supplement to deliver 30% AKBA for truly superior, reliable results. Clinically investigated, safety-confirmed 5-Loxin has been shown to produce noticeable results in as little as seven days.” For supplementation amounts, follow directions on the label. 13. Jarrow 95 Curcumin. The yin to boswellia’s yang, curcumin is one of the most effective anti-oxidant, anti-inflammatories nature has to offer. In fact, in a recent double-blind controlled test, the combo beat Celebrex hands’ down for pain relief and lack of toxicity or other side effects. The problem is that to get enough of it you’d have to eat a pound of turmeric a day. Luckily, there are several companies now offering extracts, though they’re pricy. I’ve avoided the ones with ‘piperine’ (an extract of black pepper), which is touted to make the curcumin more bio-available, because my research shows that it really doesn’t do that and, there can be digestive problems with taking too much. Life Extension has created a very concentrated form of curcumin without piperine that seems to be more bio-available than anything else I’ve found. The good news is that after it builds up in your blood stream (taking one a day) you can take one every other day to maintain the level. And right now Amazon has it on Subscribe and Save. To read more about the many benefits of Boswellia and Curcumin, go here. 14. NOW Bromelain, 500 mg.
Bromelain is a proteolytic enzyme derived from the stem of the pineapple plant that has protein-digesting properties. When taken with food, Bromelain can help to support healthy digestion; when taken between meals, it may help to support joint comfort and may help to relieve temporary soreness that is associated with muscle overuse. Bromelain is designed by nature to support proper gastrointestinal function and may also help to promote the comfort of muscles and joints. It also helps heal tissue after surgery. Do not take if allergic to pineapple or its derivatives. Warning for all four: Do not take these if you are on blood thinners without consulting your physician. 15. Jarrow IronSorb, 18mg. Iron supplements and I do not generally get along. I don’t care what they or reviewers say about being “gentle on the stomach.” They aren’t usually gentle on mine. But when I ran into a bout of anemia after surgery a few years back, this particular form of iron – Iron Protein Succinylate (IPS), an iron complex that is specially prepared to reduce irritation of the stomach in comparison to other forms of iron because it dissolves in the intestine – worked as advertised. Jarrow is the only brand that seems to make it. 16. Hyaluronic Acid, 100 mg. Research this stuff – it’s amazing. In its most effective liquid form, it’s also out of the price range for anyone but champion race horse owners. Humans need about an ounce of the stuff a day, about a quart a month. Which sells for over a hundred bucks. A month. Yikes. I did massive research on this (claims are made about whether “low molecular or high molecular” structure is more bio-available, but there are precious few controlled trials on it – and the few out there are on horses) before deciding on Now Foods Double-Strength. It was the only one that met my two criteria: no other pricy but useless junk like MSM, Glucosomine, Chondroitin – not one of which has ever passed a controlled trial, and which can raise blood sugars and blood pressure. And it delivers 100 mg. per capsule, which is the minimum that seems to be required for efficacy. Although it’s on Amazon’s Subscribe and Save for 60 caps, the 120 cap price with free shipping is a slightly better deal at the moment. Take one in the morning and one at night for several weeks or until relief, then try tapering off to one a day and see if that’s enough to maintain relief. 17. Folate Unlike the cheap folic acid in multi-vitamins that must be converted to active folate by your body – and we continue to lose that conversion process as we age – Fully Active Folate provides MTHF (5-methyltetrahydrofolate), the folate form most directly required for DNA regulation and other fundamental metabolic processes. If you have high levels od inflammation or homocystine, you should take folate daily. 18. Lemon Balm (Melissa). Wonderful as a natural relaxant and sleep aid, but also a help for anyone with hyperthyroidism. Should not be used by those with hypothyroidism. Although the ‘range’ of normal is < 150, true normal triglyceride levels are less than 100, and even lower is better. This is because triglyceride levels are directly tied to blood sugar control – or not. Which makes sense when you think about how insulin resistance works in this regard. Consumed carbohydrates convert to glucose in the bloodstream after a meal. That glucose is toxic, which is why the pancreas raise insulin: to remove the glucose from the bloodstream and deliver it (mostly) to your skeletal muscles, where it is used as energy. But when you are insulin resistant, that is – your muscle cells are now resistant to insulin’s ‘message’ – the glucose is refused. It cannot go back to the bloodstream, so it is sent down to the liver, converted to triglyceride, and stored as adipose fat. The more insulin resistant you are, usually the higher your triglyceride level. And since high triglycerides are an indicator of higher heart disease risk, reducing that level is crucial. In fact, although almost every lipid test result shows a ratio of Total Cholesterol to HDL as your ‘risk factor’ for heart disease, it’s actually useless. Why? Because unlike triglycerides, total cholesterol has absolutely nothing to do with heart disease. More about that here. A quick search on Google will show that in the last five years (at least), medical research has shown the most reliable and predictable indicator of heart disease risk is the ratio of non-fasting triglycerides divided by HDL. Why non-fasting? Because taken one or two hours after eating a meal shows precisely how tight your blood sugar control really is. The lowest risk of that ratio is expressed by < .9 – with every tenth of a point indicating higher risk. My non-fasting triglyceride level is 77 (fasting: 42). My HDL is 100. 77/100 = .77, even lower than the lowest risk. But if you have a non-fasting triglyceride level of 125, and your HDL is 25, your number is a whopping 4.0 — and you are in trouble. You almost certainly have Pattern B LDL, and not the heart-protective Patten A, as well. Reducing insulin resistance and increasing insulin sensitivity will help, as will taking anti-inflammatories, but that takes time. During the process, taking fish oil can also help lower triglyceride levels as well, and that means high levels of DHA as opposed to lots of EPA. The best and most cost-effective capsules I’ve found are these: Mega-DHA 1000 mg.
My readers know they should eat lots of fat, and Participants on the Maintenance phase of Protocol know they must eat lots of fat – but not everyone knows how to cook with a lot of fat. 🙂 This wonderful book: Fat: An Appreciation of a Misunderstood Ingredient (with recipes) by Chef Jennifer McLagan shows you how to buy it, render it, and cook with it. The recipe for Roasted Marrow Bones is worth the price alone. I cook from it all the time. Finally, to understand why you should be eating fat – and lots of it – my favorite book to date is The Big Fat Surprise: Why Butter, Meat and Cheese Belong in a Healthy Diet by Nina Teicholz. An award-winning journalist, Teicholz has written a book that you will love, learn from – and probably throw across the room after reading all the lies you’ve been… fed. A New York Times bestseller and one of The Economist’s Books of the Year 2014. 2. Capsule Machine. I use only vegetarian capsules because they never ‘melt’ or get bent out of shape in summer’s high humidity. I can make two dozen 00 size caps in about five minutes with this. 3. Capsule Refills. Since the machine lets me buy all sorts of supplements in bulk and make my own caps for a far lower cost, I use it for a lot of things. I even buy fermented cod liver oil in the bottle (cheaper than the caps) and fill my caps with that, too. They never leak. *** Make sure to buy vegetarian capsules, and not gelatin, which soften in the summer and become hard to fit together! A woman cannot live by supplements alone. Coffee – great coffee – is a necessity! I roast my own green beans, and then let my super-automatic espresso machine do the rest. No question these machines are expensive, but if you buy one that’s well-built (more metal than plastic, for one) and take care of it, it should last years. I researched every machine available (for under $2000), and dismissed all Capresso machines. It was only after I had one that I realized the brew head (which you want to keep scrupulously clean) could not be removed. It had to be done by a service company. And Capresso only allows one – that’s one, singular – in the entire country. You have to ship it back to them and only them. Same for any repairs. That’s crazy. That left me with a list of features that make a super-automatic worth having. Ability to program auto on and off times. The Accademia has three on and six off. A Burr Grinder for the beans. The Accademia is the only model under $4000 that has a flat burr grinder, rather than a conical burr grinder. Conical grinders bring out the bright acid tones of the beans. Flat grinders (often used by Baristas in good coffee shops) bring out the deep, low acid chocolate tones – my favorite. Great crema. Duh. Buttons for instant Cappuccino, Latte and Macchiatto. Check. Easy removable brew group and cleaning ability. Yep. Ability to customize everything: amount and temperature of water and foam, type of grind and amount of beans ground. Yes, Yes, and Yes. Great coffee. Oh, yes. 🙂 By the way, although it’s commonly misunderstood, espresso has the least amount of caffeine per cup, drip coffee the most. That’s because the faster you push the water through the grounds, the less caffeine goes with it. The slower the water goes through – drip, drip, drip – the more caffeine in your cup. A word of caution. The Gaggia Accademia is mostly stainless steel and weighs over forty pounds, though it has a small counter footprint. And though it comes with a one year parts and labor warranty, you’re responsible for shipping costs, though during that year it’s subsidized and only $39. After that year though, you’ll pay both ways. Amazon offers a 3-year (or 4-year) warranty that will cover shipping both ways. Just one use will have paid for the cost. I normally don’t buy extended warranties, but think it’s worth it in this case. Mason Jar Sealer Kit: Includes Wide Mouth and Regular size BPA-free jar sealers plus hose to work with just about any food sealer. Sadly, they no longer make the electric free-standing handheld model I’ve been using for years. But the jar sealers are amazing. Open crackers, take what you want, vacuum seal the rest in a mason jar, and they will stay fresh and crisp till you open it again. Can be resealed over and over – and works great on perishables like berries, too. I have the original version, without the back light. Works great for any kitchen use – but I wish I had the back light. At only $12, I have two of these. One in the house that I use for planks, push-ups and counting up when roasting my coffee beans – and one in the car to use in the gym for my Body By Science workouts, where only a count-up will do. The large magnetic back sticks beautifully to the equipment. If you cook with fat, you need a spatter screen! Even on your Instant Pot when brownibg food. This one will fit any size pan large or small, and cleans easily by hand or in the dishwasher. 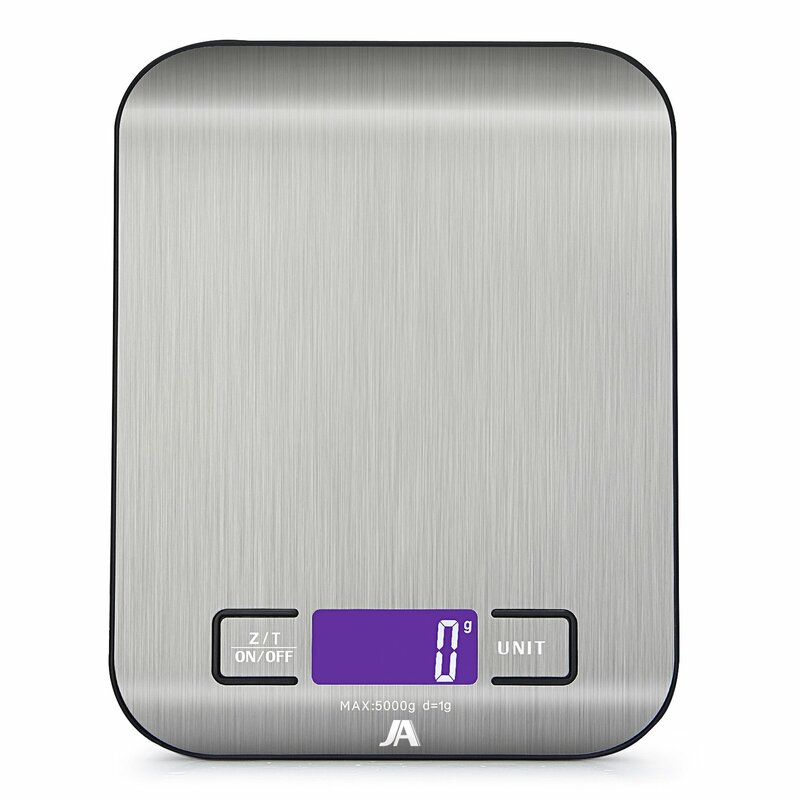 Digital Food & Medical Scale with LCD Display, Stainless Steel — 100% 5-star reviews! Stainless Steel platform; Non-slip mat; violet back-light LCD display with negative white digital, even can be used in the dark; Light weight, easy to store; easy to clean. High-precision sensor for accurate results: 4 high precision sensors (Unit-conversion switch (g/kg/1b/oz/ml/milk ml) to accurately weigh solids and liquids; Memory function for last unit setting; Volume Measurement supported. Automatic zero point tracking: Tare function can reset the current weight on the scales to zero, quick unit conversion. Automatic switch off after 70 seconds of inactivity. Low batteries indicator. All three of these food processors do really different (amazing) things. The Hamilton Beach even dices, and I’ve never heard of food processor able to do that. Lots of folks have asked me how to get started testing their fasting and Postprandial blood sugars. This kit has everything you need, including the Control Solution (which lets you know the meter is working within correct parameters, and which is usually sold separately). I’ve had and loved the original model for ten years. It’s a large counter top convection oven and a full-size, full-featured microwave – and it does both functions at the same time if desired, as well as slow cooks. And with a stainless steel interior, I can use metal in it, and clean it easily with Barkeepers Friend. I chose this model because it’s the only one that allows you to do microwave/convection at whatever temperature you choose, not a preset. And I can do 10% microwave, 90% convection (for baking), or 30% microwave 70% convection (for roasting). A baked potato is done to perfection in 30 minutes. An entire roast chicken, ditto, and juicier than just roasting it, with crispy skin. If an appliance is going to take up that much real estate in my kitchen, it had better perform many, many functions! It’s finally giving up the ghost (works fine but the dang carousel keeps turning while the door is open), so I started researching what was out there. Surely in ten years new tech would have come out with one that also does laundry or the dishes. 🙂 But after reading all the manuals of the other few micro/convection ovens out there, Sharp still offered more features, more options and gave me more control over cooking. Problem is, I didn’t want to buy a model that old, even if recently manufactured. Then a few months ago – and about time – they came out with a brand new model. It has all the great features from the model I have, and a few more bells and whistles. Hella expensive – though you save a bit if you get the white model – but when I bought my original it was $399 – ten years ago! – when you could buy a microwave at a box store for $29.99. On the other hand, it basically gives me a second oven in my kitchen (one I use all summer, so I don’t heat up the room), a full microwave, and a combo that cuts cooking time almost in half. That’s worth something. Don’t know why Amazon doesn’t have the specs yet on new model, but you can read them all, and download the user guide plus a cookbook on Sharp’s site here. And since there are so few reviews for the new model, you can read all 425 reviews and the 87 answered questions for the original model (mine) here. Dualeco Silicone Kitchen Gloves – because safety matters. These are Waterproof, Heat Resistant (up to 500 C), Oven, Grill and BBQ Gloves with Non-Slip Fingers. Great for pulling a sourdough loaf from a blazing oven, or lifting the (hot and steaming!) inner liner from your Instant Pot. Dishwasher safe – But for optimum lifespan hand wash.
Three-stage for both Asian and European edges. Helps Repair, Restore and Polish Blades. Non-Slip, Ergonomic Design. Set of 3, large, medium and small. BPA Free. Dishwasher Safe, Reversible, with Non-Slip Feet and a Deep Drip Juice Groove on one side, smooth on the other. If you could only own one pot, this is the one to have. It’s oval, so perfect for roasting chickens and other meats, stews and braises, and perfect for sourdough bread proofing and baking whether you prefer boules, batards or ovals. You can sear in it on the hob, then finish in a microwave or oven. Even cast iron can’t do that. Material does not contain lead or cadmium, nickel. Can use DIRECTLY on gas, glass, ceramic/halogen/ceramic, and electric hobs and also with a metal disc for induction. Oven, microwave and dishwasher safe. Retains all the benefits of cooking in ceramic or clay with gentle, even cooking. The lid inner ridges creates steam that self-bastes the food. Easy to clean and dishwasher safe. Made in France and guaranteed for 10 years. I love Circulon. I’ve used mine for the last three years for everything: high heat nonstick, oven up to 180C, washed by hand or tossed in the dishwasher. It still looks like new, and the thick bottom cladding means it’s induction safe with no hot spots. Great reviews and reasonably priced. This is a starter set, but larger sets in this line are available. Locking, 12″ heavy duty stainless steel. Mesh head design allows oil and juices to remain in the pan. KitchenCraft Glass Pinch Bowls / Sauce Pots for mis en place. 55 ml /2 fl oz (Set of 4) – currently an Add-On product. Dishwasher and microwave safe. At this price, buy 2 sets. Cooking for Geeks: Real Science, Great Cooks, and Good Food – a cookbook that teaches techniques, not just recipes. In Body By Science, bodybuilding powerhouse John Little teams up with fitness medicine expert Doug McGuff to present a scientific formula that maximizes muscle development in just 12 minutes a week. Backed by rigorous research, the authors take you step-by-step through a high-intensity training (HIT) body-building program that will increase strength, build muscle and rev up your metabolism. Best Naturals Ashwagandha is GMO and solvent free, in vegetarian capsules. Great for lowering stress and cortisol, as well as helping you achieve better workouts. This entry was posted in News You Can Use, Supplements and tagged Hypothyroid, Insulin Resistance, Obesity, SugarFree Protocol, Supplements. Bookmark the permalink. That’s certainly an interesting list of supplements, and explanations. I do have a question about your advice to take vitamin D in the evening – what is your reasoning for that? I ask this because Seth Roberts has written extensively about taking it in the morning, and, when I tried this, I found that my sleep did indeed improve. Also, I’m not sure the concern about vitamin A (from cod liver oil) is really justified. Most people don;t get enough A, and many can’t make it from beta carotene. And, getting enough D and K2 protects against A toxicity. Your diet recommendations (which I am not familiar with) may be a high A diet, in which case supplemental isn’t needed, but most people, especially those trying to “eat healthy” (i.e. avoid high cholesterol animal foods like egg yolks, dairy fat and organ meats) are low in A. Great blog, I look forward to learning more about what you have learned! As for the A from fish liver sources of D (I didn’t mention Cod Liver Oil, though I believe NON-fermented CLO shouldn’t be taken by anyone), it’s too much for anyone who is on my Protocol and therefore eating a truly healthy diet: high fat, cholesterol, egg yolks, butter — and liver twice a week. I do agree that getting sufficient K2/MK-7 does protect against A toxicity as well as arterial calcification, but given the current manufacturing practices for many supplements, do not feel that we have any idea just how much A is in typical D products on drugstore shelves. So I take D from lanolin, for the same reason I use unsalted butter when I cook: I can better control the amount of salt in a dish. Thanks for the kind words about the blog, and I hope you will continue to write! I’ve learned a lot from both of your last posts. Thanks for sharing all this important information in easy-to-understand format. Like you, I am a knee replacement candidate, and will probably have both done at the same time. But I’m too far gone for MAKO. In the packet I was given to study for preparation, it says that I must stop all supplements before surgery and after surgery take antibiotics and blood thinners, like Coumadin. I’m guessing that’s what the aspirin was for in your case. I don’t think this doctor will make concessions, but he comes highly recommended and I do want him to do the surgery. I will be in rehab hospital for about a week after and will try to follow your diet. That was something I was worried about, since they do like to feed you high carbs and lots of grains in hospitals. I’ve started taking the Boswellia, super curcumin and also got the 5-Loxin. I’ve started a total grain free diet a few weeks ago, and feel very good doing this. Basically just meat and good fat, veggies, nuts and berries. Thanks for any additional thoughts or advice you can send my way! Barbara, thank you for writing. The only thoughts I can add to your summary is that Coumadin is considered an old drug no longer used much because of possible liver damage. In fact if you decide to take it, you’ll need to go in for weekly liver blood tests (one of the reasons most doctors have stopped using it). Doctors who still insist on anti-coagulants other than aspirin have moved on to Lovenox, which is injected once daily into your tummy (you do it yourself and won’t even feel it there) and does not require blood tests. Keep in mind though, that Boswellia and Curcumin are powerful anti-coagulants and must be stopped at least a week before surgery. It’s all I used after surgery, as you know from reading my post on this. As for Protocol, I must emphasize that it is not a “grain-free” way of eating. In fact, a modest amount of starch carbohydrates like potatoes (white and sweet), rice, bread (without added sugar in any form), beans, pasta and corn in a modest protein, high fat diet are not only good for you, but imperative for metabolic good health. Especially for women. Double that for anyone recovering from illness or surgery. And in the case of post-surgical recovery, calories do matter. As in lots and lots and lots of them. As for waiting until you go to rehab to eat well, I suggest not. It will help your overall recovery to speak to the Head Dietician in the hospital two weeks before surgery, and explain your food needs: no sugar, no vegetable oils except olive, real butter and heavy cream with every meal, no ‘casseroles’ or veggie/meat mash-ups (hospital favorites since they can lower the cost by adding lots of cheap fillers), but instead plain meat, veggies and a starch with lots of butter, cream and/or sour cream on the side. You can bring in your own nuts and berries to have with plain whole fat yogurt. In the days right after surgery it’s important to get those nutrients into your body, and not wait for the two or three days you’ll be in hospital. Thank you so much for your thoughtful response, SugarFree. It gave me much to ponder. I am thinking of calling the doctor’s office and asking if they might substitute something else for the Coumadin, not comfortable with it at all. And I agree with your suggestions for what to eat before and after surgery. I have a substantial amount of weight to lose and am hopeful I can get rid of some of it before surgery – which is planned for mid April. I am following your suggestions because I do think it’s the healthiest way to eat. I was wondering how many carb grams you eat per day, if that’s one of your considerations? Do you limit carbs, other than sugar, at all? Thanks for the good wishes, and I will let you know how things went with the knees. Wishing you all the best as well, and hope you keep posting those great informative articles! This list is a bible to me. I wonder if any of your recommendations have changed, or if you would add any. I incorporated most of them two years ago. I haven’t isolated which of the joint pain/anti-inflammatory recommendations work best, and I’m afraid to try (I’m an all-or-nothing kind of gal). Amazing relief of my knuckle and hip pain when I take all daily. Skip three days, I’m in trouble. Martha, thanks for writing – please look for a reply in your email inbox! I had my first cup of espresso from the Gaggia Accademia and it was like drinking chocolate. I loved it! Thanks for the recommendation. More, more kitchen stuff! You should have a page that has all cooking and kitchen supplies. That would be a dream. Michelle, I’m so glad you love the Accademia as much as I do. 🙂 I like your idea about a separate page just for Food and Kitchen Tool recommendations, and will work on setting that up soon. I just spent an hour (my first, but not my last!) reading your blog, I can’t believe how much I learned about me in such a short time. Even after an hour, I realize how badly I’ve treated my body all my life. Thank you, SugarFree, for what you are doing!